With cutting-edge mobile-friendly website templates, you do not have to worry about your page’s performance. We went on a wild journey to collect only the most valuable products that help you build outstanding websites. All these templates were put together with mobile users in mind. They smoothly and fluently adjust to any screen resolution in an instant. This calls for first-class user experience and happy visitors. Besides, many of those visitors are also your potential clients which may fully commit if what they see if what they need. On mobile, seconds, heck, milliseconds matter! If they do not get the answer immediately, they will leave early and you might just lose another possible customer. But that is something you do not have to struggle with anymore. Your sites will, from now on, offer insane responsiveness because the mobile-friendly website templates are here to take care of it. The templates use the latest web technologies what makes them not only quickly adjustable to any screen resolution but simple and efficient to customize, too. Be always prepared with professionally designed and developed responsive website templates. You can effortlessly overcome even the toughest challenges and set up the most advanced websites. 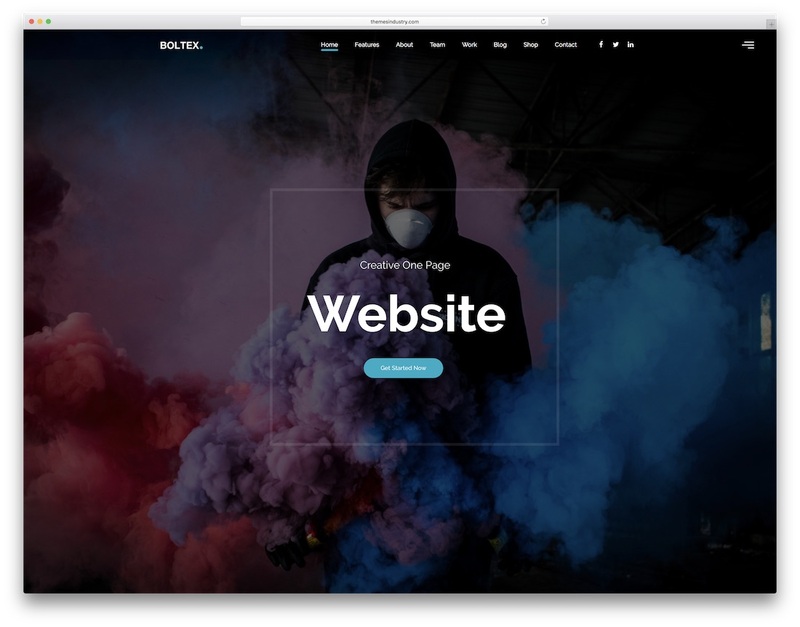 With Boltex, you can have a killer one-page website up and running in as short space of time as possible. After all, the mobile-friendly website template is stacked with features and assets for you to benefit from hugely. In the kit, you will discover over thirty layouts and more than fifty elements, as well as an array of other traits. Out of the box, you can easily create construction, gym, food, portfolio and startup pages to name a few. Moreover, due to the ease of use, you will have a blast establishing your internet appearance. Look no further and enjoy the process. Some other features of Boltex are retina-readiness, SEO optimization, full documentation, Revolution Slider and parallax and hover effects. Do things complex or super simple, whatever the case for you, it is Boltex that will help you realize all your ideas. For industry, factory, engineering and even construction, Indofact is the free mobile-friendly website template to rock. It is a niche-specific layout with multiple options to give you unlimited possibilities. No need to be holding yourself back when Indofact is powerful enough to suit even the pickiest users. That said, if you would like to modify it, by all means, do it at free will. However, there is a good chance that you will like one of Indofact’s several demos out of the box anyway. 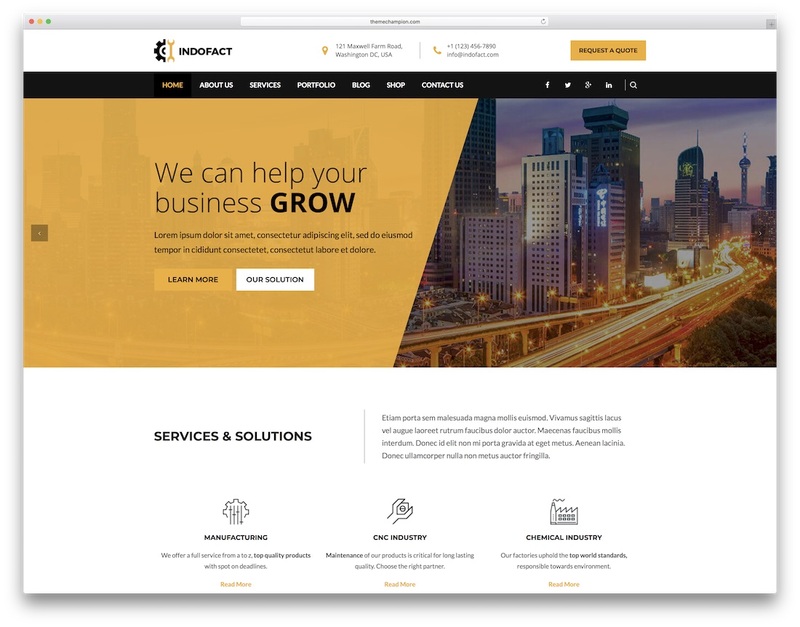 Five and counting stunning home page demos, all sorts of different internal pages and a horde of valuable features await every Indofact user. Speaking of assets, Indofact sports a pixel perfect coding, is optimized for fast loading speed, comes with a working contact form and based on the well-liked Bootstrap Framework. And if you need any additional support, make sure you reach out to the dedicated support team and they will be happy to help. 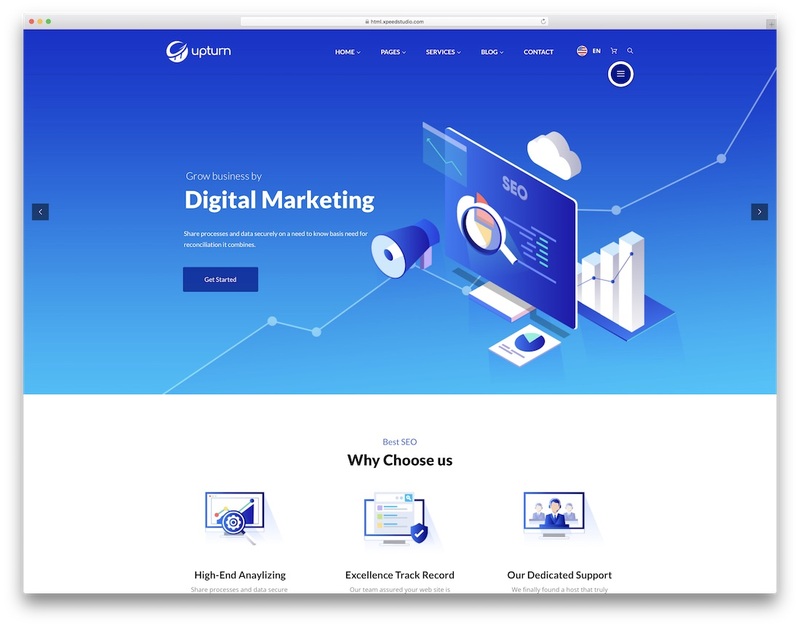 Upturn is a special mobile-friendly website template which you can employ for all sorts of SEO and other digital marketing agencies. 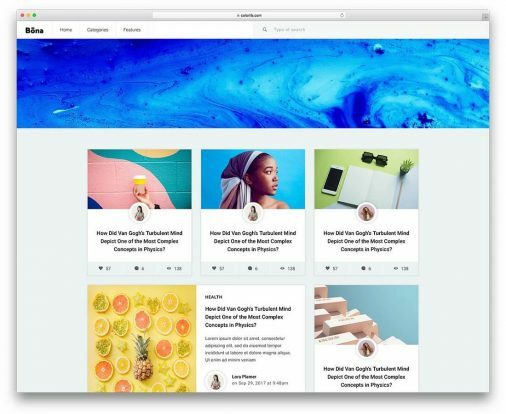 With three multi- and two one-page front page demos, you can quickly decide what will be the style of your page. From then on, you can edit Upturn with your content and information or you can even adjust the web design and customize it. In both cases, it is a guarantee that your end product will be a high-end creation. Bootstrap 4, unique elements, two menu layouts, owl carousel, retina ready, cross-browser compatible, all this and loads more is what Upturn is all about. To continue the hype, Upturn loads content on scroll, has lovely hover effects, two-level pricing tables and widget-rich footer. Do not forget to implement blog and use it for content marketing and drive in an even larger volume of traffic. 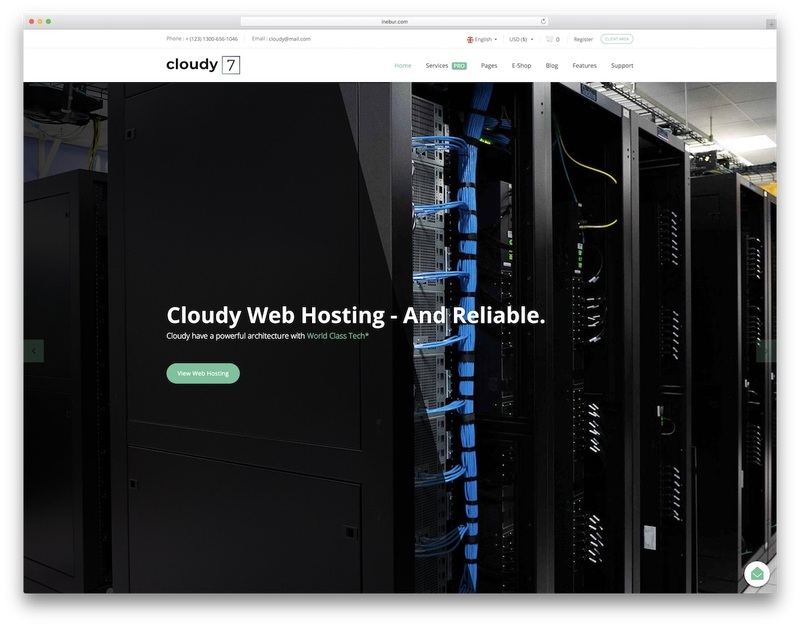 For web hosting services, Cloudy 7 is one of the finest mobile-friendly website templates you can get today. It is an up-to-the-minute, polished and high performing tool that will save you plenty of time and energy. Instead of doing all the magic yourself, it is Cloudy 7 that will do the trick for you. With predesigned content and all the included features, you can craft a fantastic internet presence quickly and efficiently. But do check live preview page first and see all the amazingness Cloudy 7 brings to the table yourself. In total, you get over sixty HTML and CSS pages, four index demos and more than 25 custom shortcodes. While this, on its own, is already a ton of stuff, Cloudy 7 also has other features prepared and integrated for you. Massive slider, typewriter effect, mega menu, custom blog pages and a cool live chat feature, you see, Cloudy 7 is very serious when it comes to delivering the necessary components and then some. Pofo is a massive responsive template for creative websites of nearly any type. 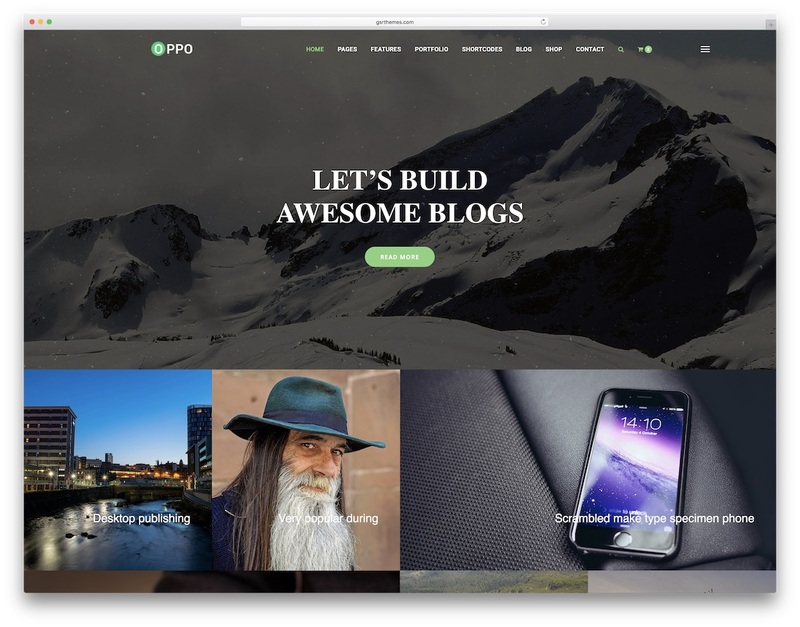 Agency, corporate, portfolio, small and medium business and blog pages, you can do them all effortlessly with Pofo. For the most part, predefined demos are already available for you to start building right off the bat. In the Pofo template package, you will find loads of content that will benefit you greatly. There are a whopping 210 HTML pages, more than 150 handy elements and eye-catching portfolio and stunning headers. Pofo is a serious deal when it comes to the best mobile-friendly website templates. The best part is, it is so flexible and adaptable, you can create three entirely different websites with it. Add a touch of your artistic mind to it and you unlock even more options. If the previous, Pofo, was immense, Stack is a real behemoth of templates. Seriously, sit tight because Stack’s capabilities and ready-to-use material will blow you away. It is like no other. However, each responsive website template you find in this list is unique in its own way. But let’s get back to Stack and see what makes it so special. First things first, Stack is not only a template, it also comes with a page builder to make it even simpler for you. Newbies, you are welcome. Moreover, there are over 140 predefined layouts of which thirty are carefully crafted home pages. 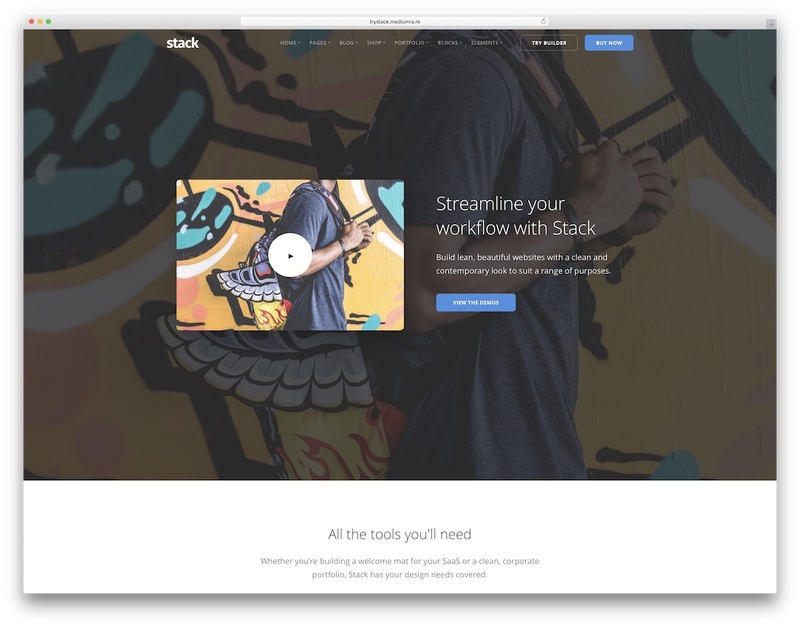 Stack is a multipurpose website template with more than 240 modular interface blocks, powered by Bootstrap Framework and easy to modify. With a multi-functional and mobile-friendly website template like Webster, you are equipped with all the necessary and then some. You feel comfortable building a wide range of sites for businesses of all sorts. We will not even go into too much details here because the numbers might cause giddiness. You better take the extra time and see all the amazingness yourself while checking out the pre-made content. However, it is a must to say that Webster template has a lot of home, log in and signup, about and blog pages. Mix together what is at your service and have the ideal website live in no time. And if you are a freelancer, you can use Webster for a vast array of sites in different industries. Coin market, too! You can simply add the parallax effect to your page and distinguish yourself from the competition. 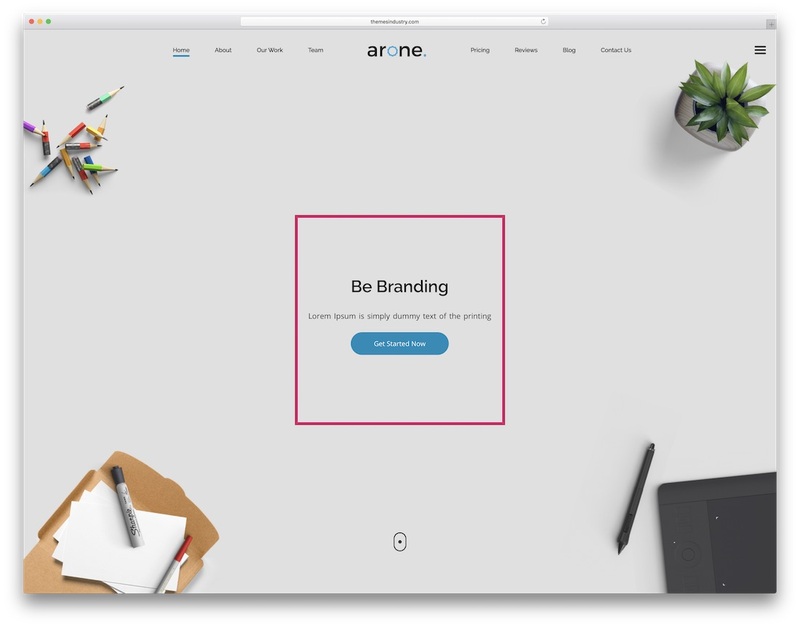 Instead of doing it yourself, Arone is the one-page website template which has it integrated into the layout for you. It is mobile-friendly and fits creative websites to perfection. Agencies and businesses, Arone is the ideal template for you. Still, you first need to dig the design and all the rest follow naturally. Speaking of Arone’s design, it is clean, modern and sophisticated, exactly what you need. 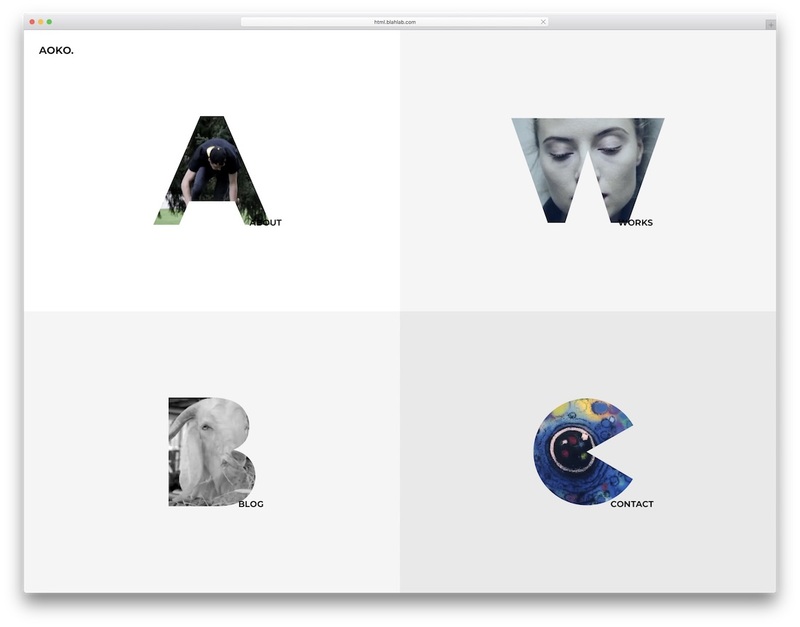 Pick any color you want, choose one from several available fonts and take to your advantage Arone’s RTL support. Along with a great deal of front page variations, indeed, one is cryptocurrency ready. Who would have thought, right? Get busy and develop the supreme webpage. Having a high-end technology website template at hand, you can quickly and effectively put together app, SaaS and software websites. One of such tools is TheSaaS template. It is a Bootstrap Framework item what makes it mobile friendly and easy to edit and maintain. 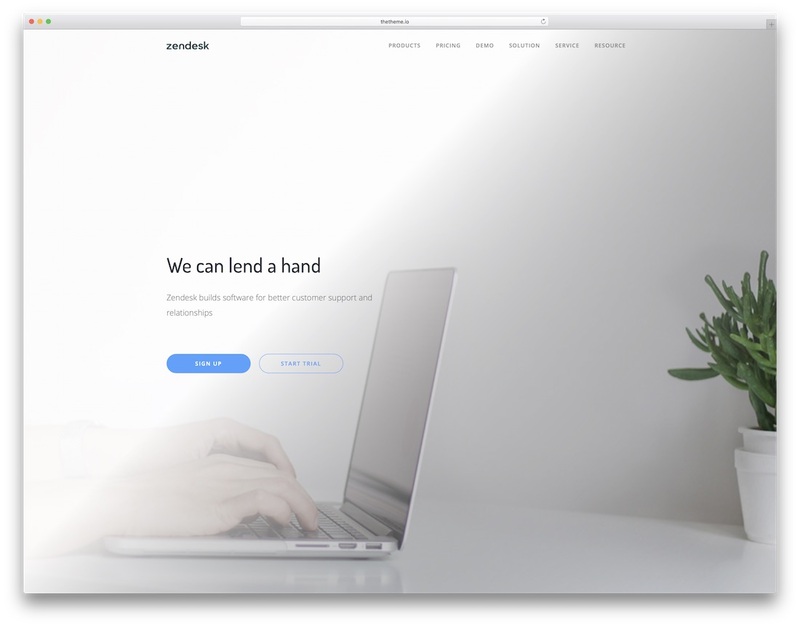 In addition, TheSaaS has available sample landing page software lookalikes of which some are Slack, Skype, Zendesk and GitHub. Very clever! In TheSaaS bundle, you will find both normal and minified CSS files, over sixty HTML pages and fifty and counting components. If you are a beginner with barely any programming skills, just use what is up for grabs and you are good to go. Do not forget to look into the in-depth documentation and find all the answers to your questions. 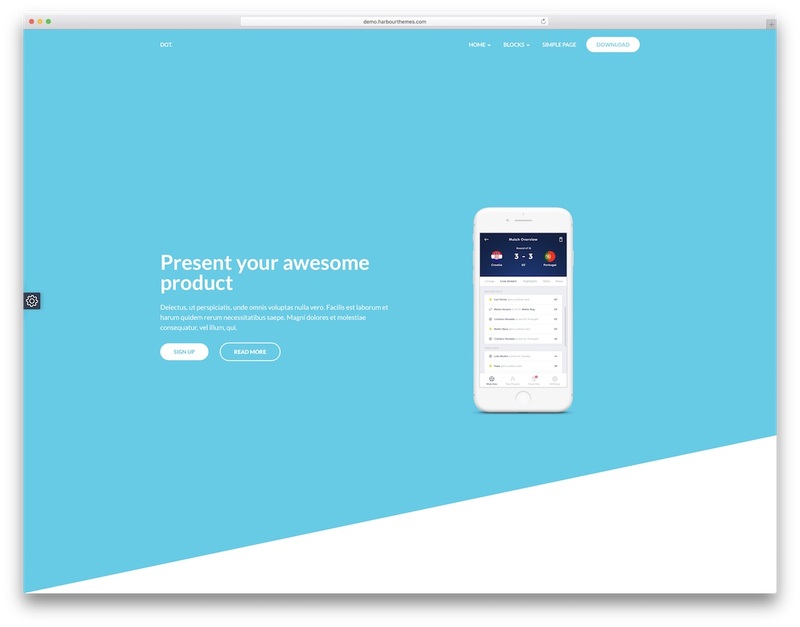 Impress clients and customers in an instant with the Kotlis template. This mobile friendly website template is ideal for any designer, freelancer, photographer and personal portfolio. Kotlis comes with a clean and open-minded design that is easy to use and customize. In the kit, Kotlis includes seven homes, six portfolio pages, as well as an option to pick a dark or a light look. To create a strong and lasting impression on all your visitors, Kotlis is one of the best solutions for you. 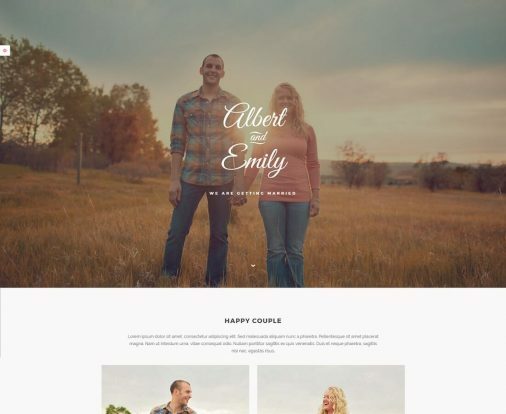 This all-out template is indeed responsive so you could easily view it on any device and browser. Other goodies of Kotlis are working contact and subscription forms, Instagram and Twitter feeds, video backgrounds, Isotope plugin and news section. 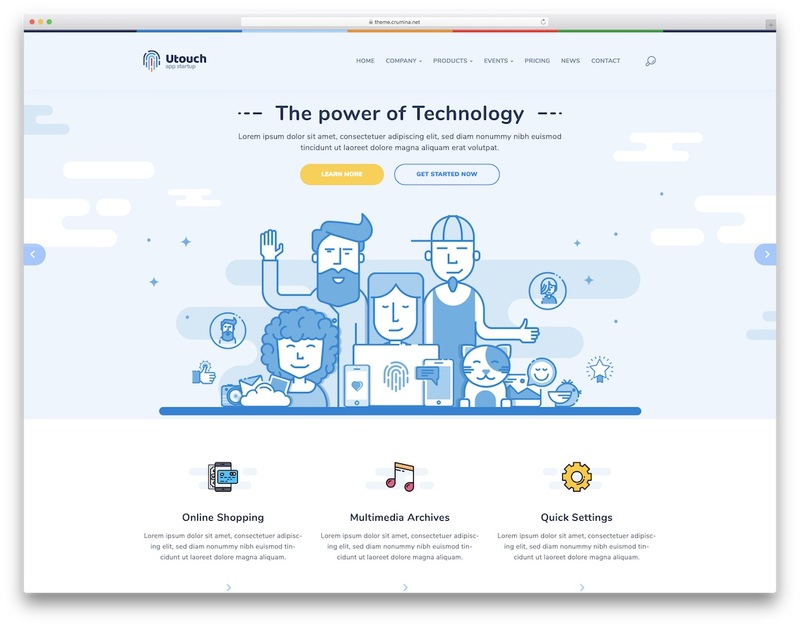 With Kotlis, you can have everything you need in a website. Make your business fruitful with the amazing Tejarat. This mobile friendly website template has multi-purpose functionality, based on the Bootstrap Framework. Choose from sixteen home page demos, all of which look professional and interest sparking. You can also imbue your site with custom content and enrich it with your distinct touch. Combine multiple colors and fonts, and customize them expediently. Tejarat is very well commented and has proper documentation for easy use. 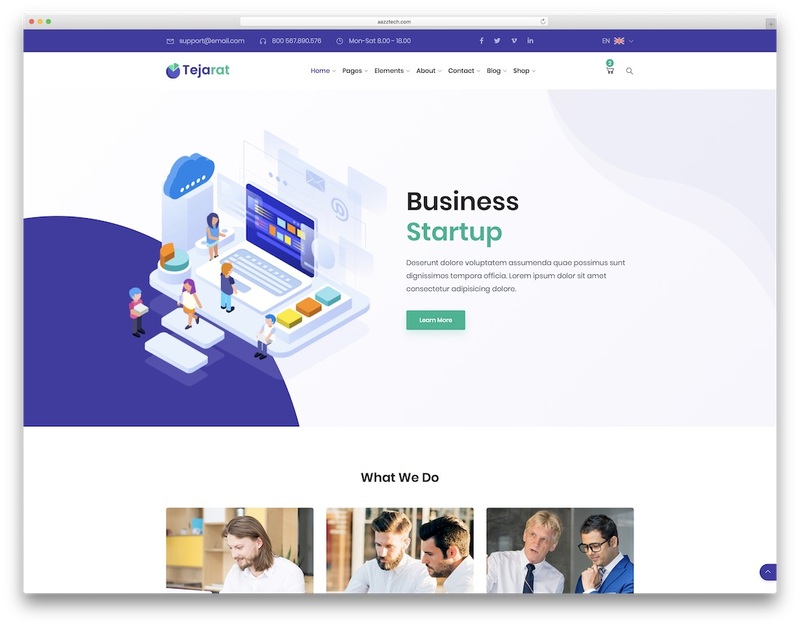 Tejarat has a powerful and modern design perfect for finance and consultation agencies, startups, software companies and many more. Other core features include Google Fonts, Revolution Slider, online store, RTL support and a vast collection of shortcodes. Add blog posts or articles as well and get content marketing going strong. With Tejarat, you have multiple options to hammer out a terrific website that will put you ahead of the competition. Have you ever thought of trying the Xcent template for your website? If you are new to it, you better sit tight or it will blow you away – literally. Here are many reasons why you should not miss Xcent and make it your own. This mobile friendly website template has a minimal, responsive and raw look perfect for agencies, designers, freelancers and photographers. It has lots of ready-made homepage layouts and components to choose from. Xcent features a unique and sophisticated design that will put your website on top. In addition, you can edit your site with sliders, headers, page titles and icons as well. No need to use the sample out of the box, you can freely update and improve it to your heart’s content. 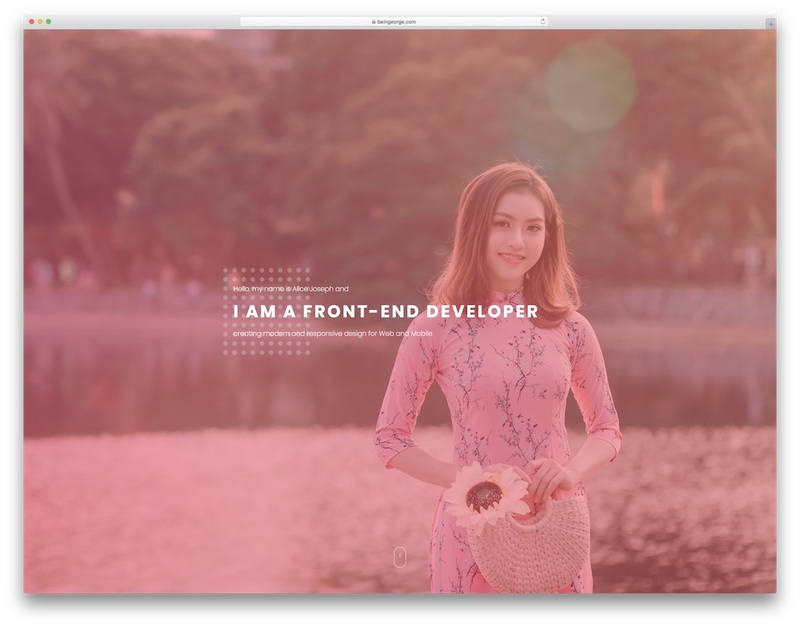 With other features such as parallax effect, you can spice up the experience and appear even more professional on the web. Go for Xcent and you will never look back. You know beforehand what COINEX is all about. As expected, it is a cryptocurrency website template for businesses and projects that have something to do with the coin market. That could be finances, blog, exchange, mining and similar. This mobile-friendly website template has all the needed sections to present yourself on the web in the most professional way. There is also a coin calculator, you know, if you need one. 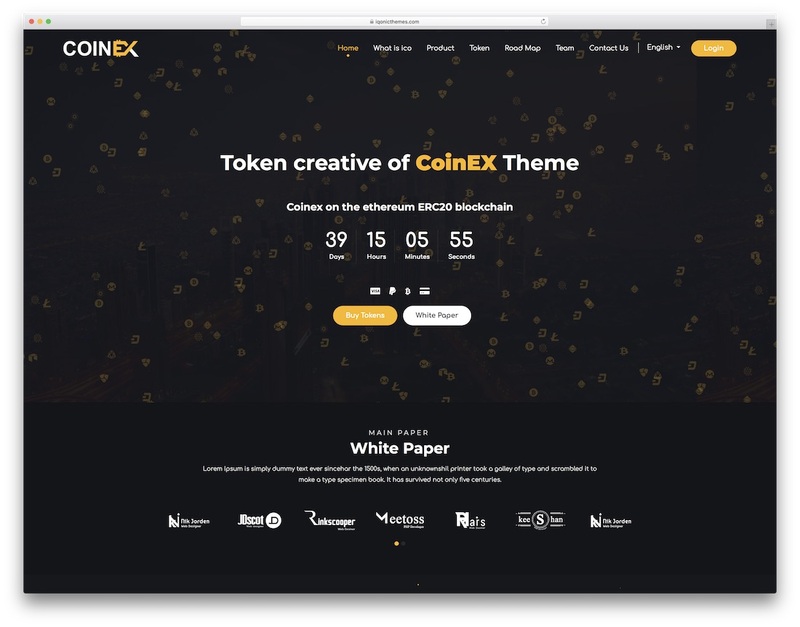 COINEX brings to the table several dark and light layouts and features, like Revolution Slider (for free), Owl carousel and parallax effect. Retina ready, cross-browser compatible and integrated contact form and Google Maps, you see, COINEX does not miss a thing. Cryptocurrency industry just got a new competition, you. Do you need a admin template for your extraordinary forthcoming application? Drop everything and look no further, you just came to the exact right location. This was some highly rewarding scrolling, wasn’t it? Enough of me blabbering, let’s finally get to the point. Sometimes, we need to get you ready to introduce you to the actual product because it is just so ridiculously amazing. Giving it straight away, it might cause too much of emotion. Apex is the template of choice for your administrators and dashboards. It is based on Bootstrap Framework what makes it a mobile-friendly website template with uncomplicated customization. Apex has miscellaneous convenient sample layouts to speed up your workflow and have the final product ready ASAP. On top of that, you get three different menus, six forms, three chart libraries and a starter kit for developers. 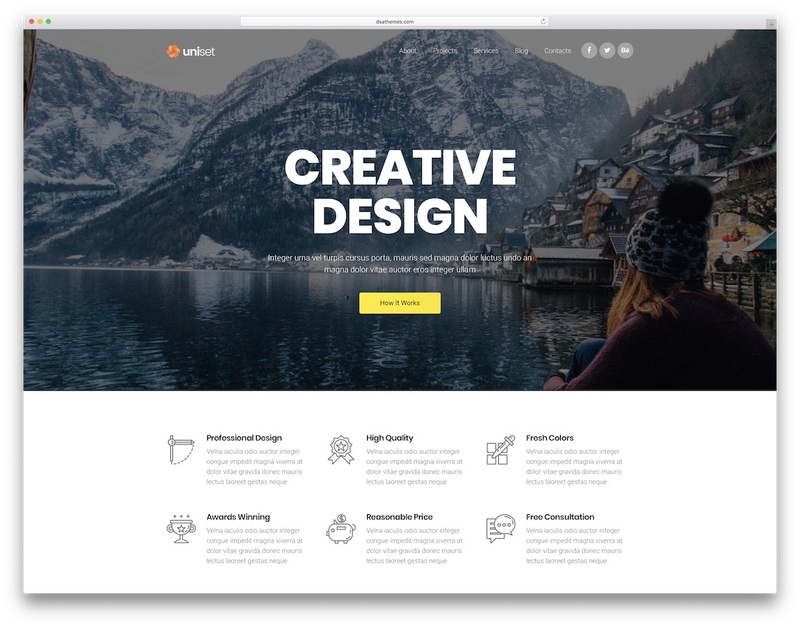 UniSet is a sleek and creative, responsive multipurpose landing page website template. It is a slender package that includes compelling, polished demo websites. Setting up shop online with your project has never been easier than with UniSet. All you have to do is pick a template and customize it in a few clicks. Add your content, and you’re ready to go live with UniSet. Creative agencies, small businesses, corporations and freelancers love UniSet. It gives your website a professional look without writing a line of code. Splendid visual effects make UniSet websites engaging and dynamic, appealing to broad audiences. 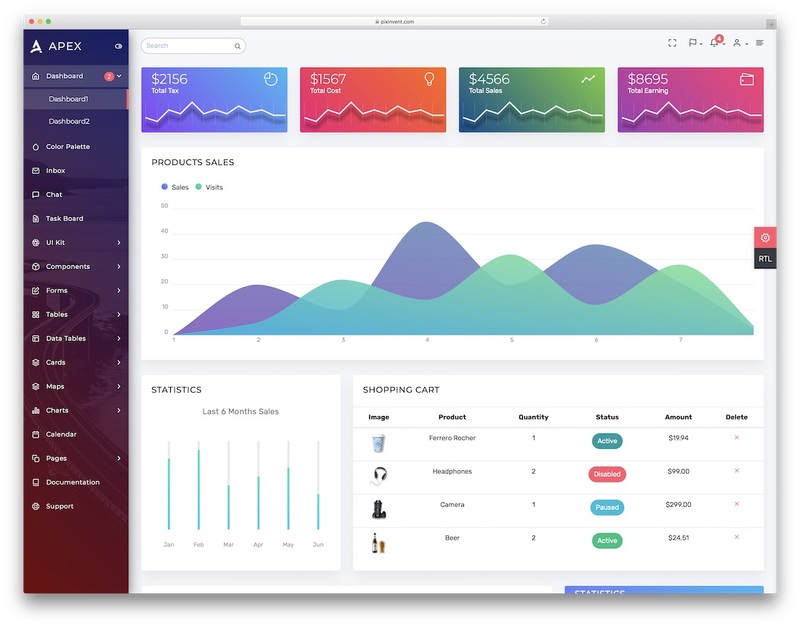 Bootstrap technology makes UniSet inherently responsive and cross-compatible with all platforms. Tons of handy plugins add wonderful functionality at every turn. Deploy a modern and unique landing page for your project today and build your audience. UniSet has what you need to make it big! 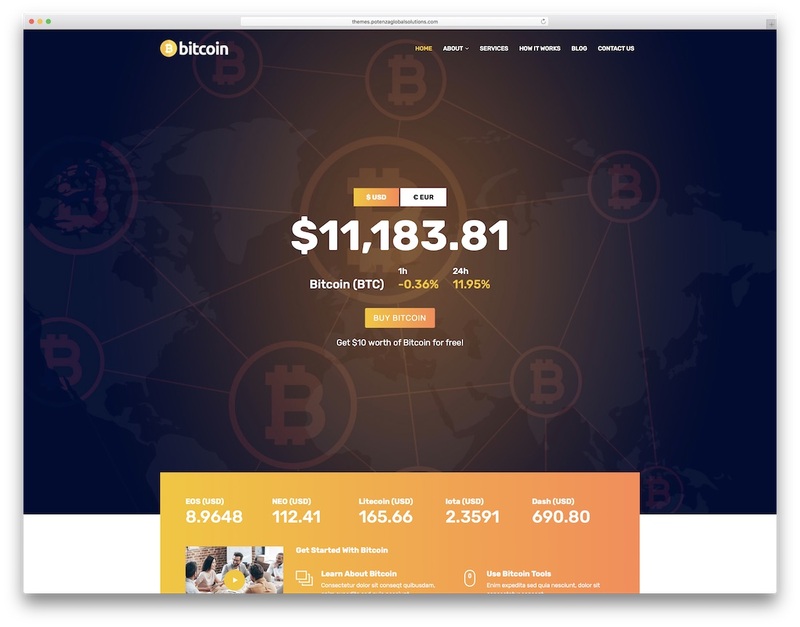 Amongst all the mobile-friendly website templates, you could expect that some will be bitcoin and cryptocurrency related. I mean, since we follow the hype, of course we will add them to the collection. 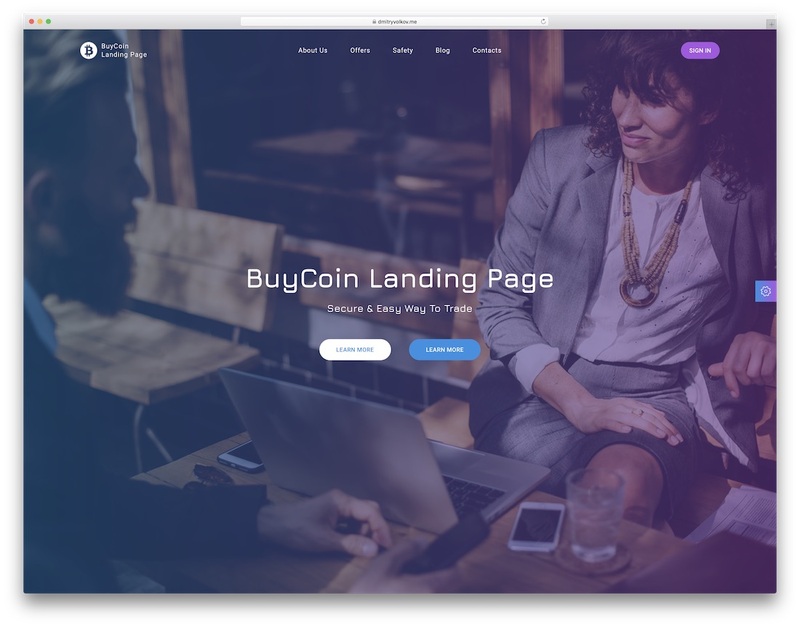 Whoever is in the industry or plans on joining the coin market with a new big thing, help yourself out with BuyCoin template. A contemporary HTML template that you will love from top to bottom, from header to footer. But first, you need to choose one of three landing page demos. One sports a background slider, the other parallax background and the last one is for those who like to keep things simple with a static image. For your information, more samples will drop in the future. As a mobile or web app owner, you undoubtedly need a compelling web presence sorted out. 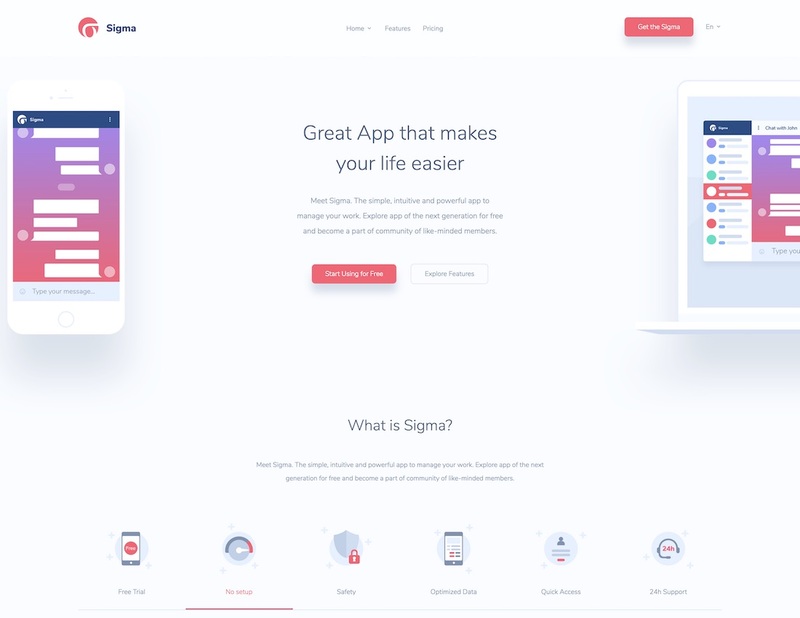 If a website is still something you did not build yet or you think your current one is poor in quality and performance, you should examine Sigma. With mobile, messenger, web and desktop app front pages, you can get down to business immediately. While that already give Sigma a big plus, it gets extra points for taking care of pricing, about, privacy and other pages. That is correct, all these index and inner pages are at your disposal. What makes Sigma even cooler are the included free vector mockups which you can edit at free will. Now that is just phenomenal! When you plan on launching a new online project, set up a page using mobile-friendly website templates. If a page is not responsive in the modern age we are living, you can forget about witnessing any decent results. Especially if we speak about apps, software and any other services you offer that solely rely on the web on mobile audience. 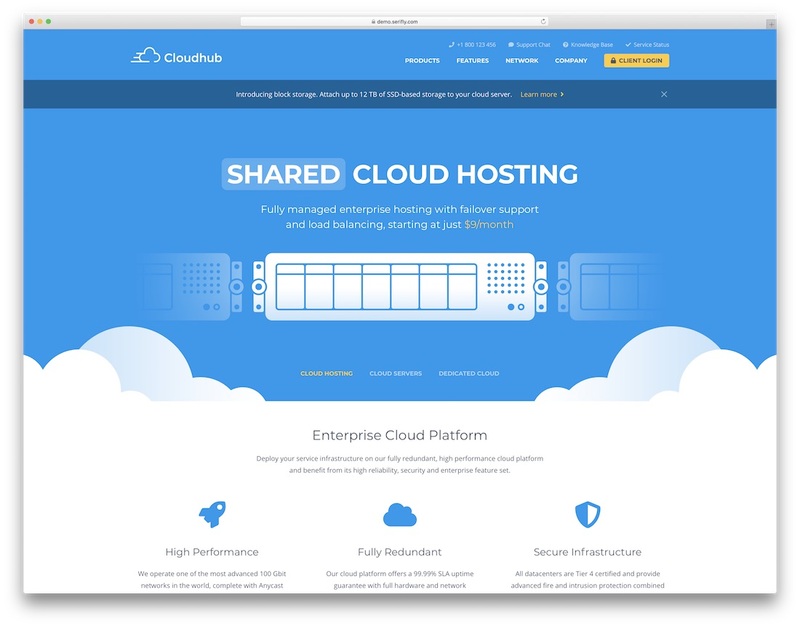 For a hosting website, Cloudhub web hosting website template is here to take any challenge. You will have a blast using this exclusive template, Cloudhub, with custom server vector icons. You might not even need to do much regarding the web design other than filling it with your content and information. Nine layouts are there, each sporting a light and optimized code for incredible performance. Combined with the features and your own adjustments, the options are endless. 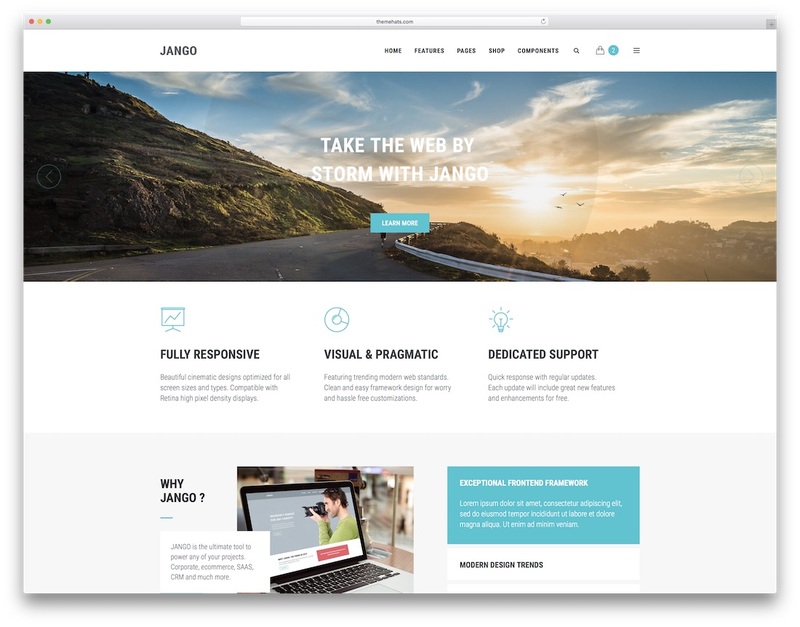 Jango is a powerful multi-purpose template built using SASS and Bootstrap. The tool is entirely responsive and highly customizable. Along with many one- and multi-page layouts that you get in the packet, Jango has loads more to offer. One of its specialties are components. What is that, you may ask. Jango is a components framework based mobile-friendly website template with infinite possibilities. It is structured using reusable block which you can easily reorganize and frame in your exact order. From the diversity of layouts to myriad of features, Jango is the template that fulfills many, if not all, users. You can keep things simple and to the point, or go heavy and complex with the design, nothing is hard and difficult for Jango. Ten templates and two color schemes, that is what Dot template is all about. But to be frank, there is way more hiding behind this contemporary and fluid tool for apps, software and SaaS products. It follows all the latest trends and tech regarding performance and web design. Dot is a promising mobile-friendly website template to showcase your product and push it globally. Dot is SEO friendly, prepared for the retina displays and cross-browser compatible. Since Dot is a Bootstrap website template, the pliability is there, you just need to leverage it. That is something you will not have an issue with. The code of Dot is organized and commented so even beginners will take their websites to entirely new levels. 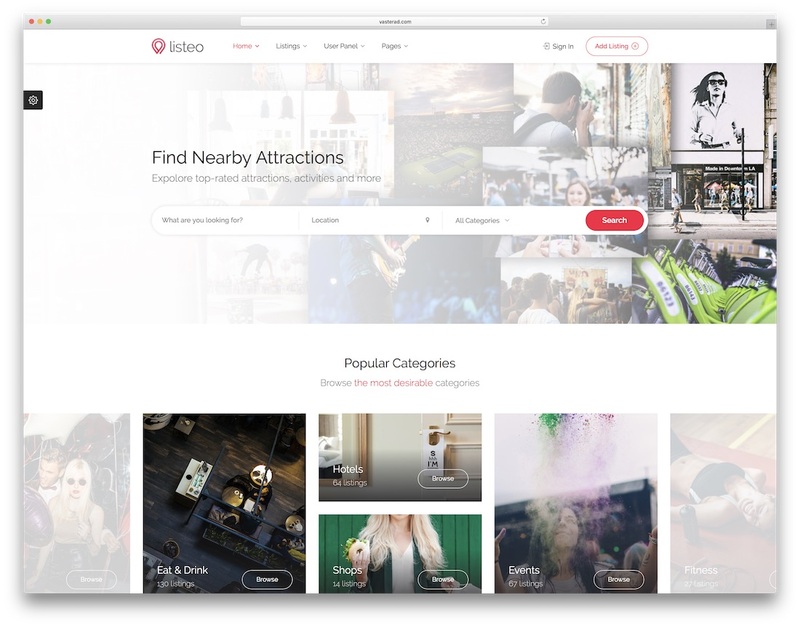 With the ultimate directory website template, Listeo, you can build listing pages easily. The exclusivity of Listeo are the additional admin panel and the integration with Google Maps API. Now, you can display all the listings on the map. That said, use Listeo for restaurants, hotels, bars, concert venues, etc. In the package, you will also find a date and time picker, an invoice template, four front pages and well over two thousand premium icons. Create outstanding slideshows with Revolution Slider and let users enjoy browsing your directory website from their mobile devices. The comfy off-canvas mobile navigation calls for even higher user experience. You can also foresee a fully working booking widget, so that is something you do not have to take care of yourself, too. 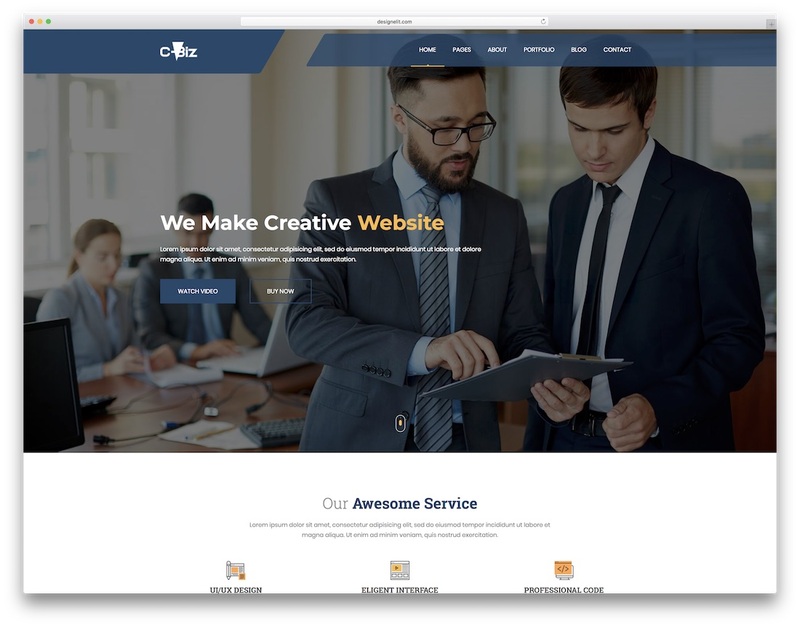 C-Biz stands for a corporate business website template that you can use pretty much for building any page under the topic. Editing and managing the item will be no sweat so make sure you use C-Biz to its full potential. Basically, all the elements you see in the live preview are modifiable. If there is something you would like to change, go ahead and simply do it. There is no need for you to feel in any way limited. 100% responsive and mobile-friendly, smooth CSS3 animations, Fancybox gallery and a pop-up video, C-Biz might just have a lot more in store than you need. 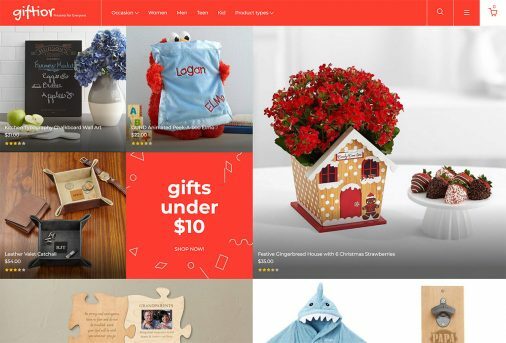 You will also find testimonials slider and functional contact form but it is the full-screen slideshow what will help you lured visitors into your world. Do you want to build a personal website but at the same time take care of your client’s page? No need to be purchasing two mobile-friendly website templates separately. You can take advantage of Hook template and create two (or five) fully different websites with it. And it will happen swiftly since most of the work is already completed. Go with the available twenty demos (22 actually!) and improve them accordingly. You can construct a stunning creative agency website, a page for a photo studio or get the excitement going early with a coming soon site. But that is just a small slice of the Hook cake. Benefit from multiple headers and footers, Instagram feed, newsletter subscription box and other goodies. Just as fun as it is checking and experiencing Utouch’s design, so is bringing into being a website with it. In general, Utouch is an app startup website template but in reality, you can use it for loads more types of sites. It is just a matter of tweaking it a bit and you can shortly have an entirely different look. But more or less, it is just a matter of changing the content to tailor the tool to your needs. Utouch has 34 HTML pages with a convenient and well assembled code for smooth website development. In the package, you will find a cool set of SVG icons, sliders, galleries, a sticky header with four different hover effects and a drop-down menu. A great deal of uniqueness going on on Utouch’s template that is for sure. 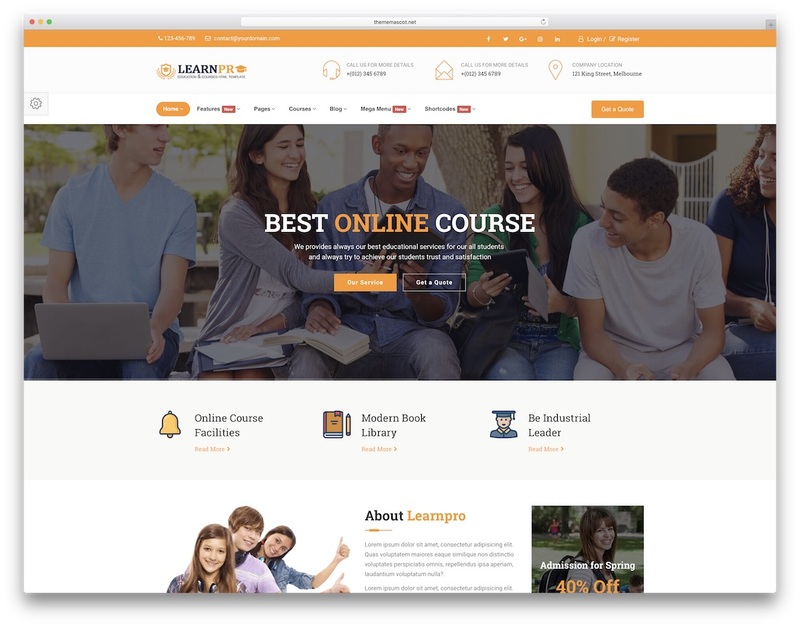 Do you need a website for your school, university or online courses? Education Course is the mobile-friendly website template that has you covered with just about everything. Seriously, it requires hardly any work on your end other than doing some assembling and adding your content and information. From six single page to six multi-page layouts, Education Course also treats you with dark, boxed and RTL versions. The education website template is a detailed pack of features and extensions. Six different color presets, neat headers, side push panel and widget-rich mega menu, Education Course has it all. Contact form with reCAPTCHA, Google Map multilocation and a variety of charts, it is all part of the unit. Aoko is a uniquely designed HTML template for professional individuals, creative agencies, design studios and portfolio websites. It sure is a web design that you do not see on a daily basis. Meaning, if you would like to distinguish yourself from the crowd of creatives, do it with Aoko. The idea behind Aoko is phenomenal and the interactions on hover even greater. To deliver the most original experience to everyone who visits your website, this just might be the ideal template for you. But to truly understand the power of Aoko mobile-friendly website template, you need to see the live preview. I could write a novel but seeing it real-time would be something entirely different. Enjoy this novelty of an HTML website template. Oppo is one of those enormous mobile-friendly website templates that you can use for literally anything. Of course, for as long as it is website related, other than that, you are free like a bird. The freedom Oppo template offers you is unmatchable. The number of home page variations is now already in the forties while the quantity of overall HTML pages greatly exceeds two hundred. With eleven headers and eight footers, more than one hundred shortcodes and other handy components, Oppo is a singular template. Each demo you choose helps you bring into the world a remarkable website with a memorable experience. Add a video background, create a fresh slideshow and amaze guests with smooth CSS3 animations and parallax effect. You need to build a portfolio for your freelancing business, don’t you? Or you might be an agency with the same intentions. Whatever the case, with mobile-friendly website template, Berlin, you are ready to rock the online world. Not just rock but shake every industry you are in. That could be photography, architecture, web design, art, you name it! 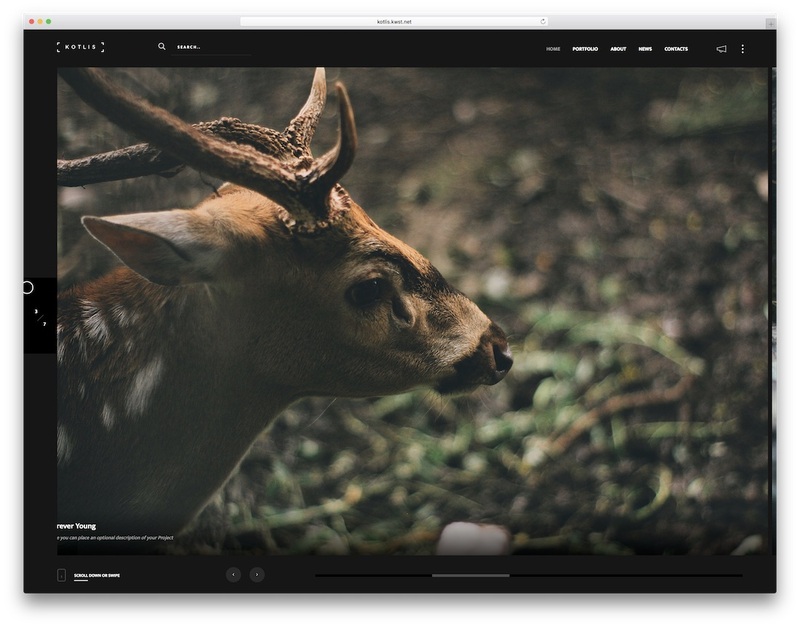 Berlin has static, slider and video versions along with blog and single blog page predefined for you. 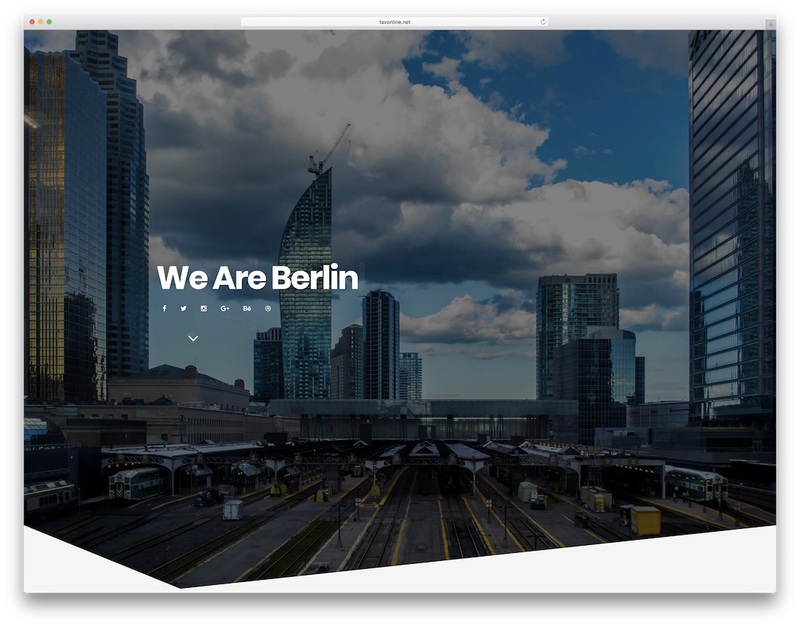 Berlin is a minimal, clean and simple website template with an emphasis on your works. Promote what you excel at and start taking new business deal regularly. 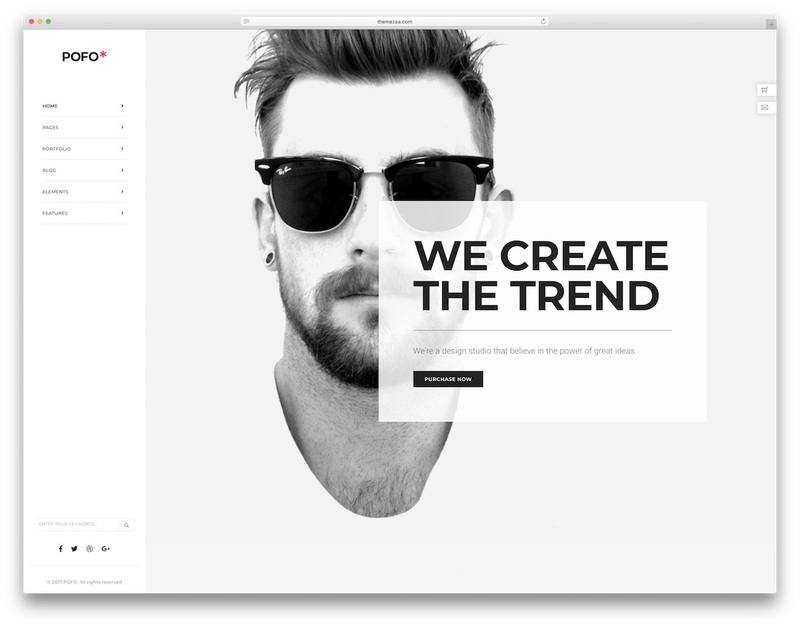 With Isotope portfolio, your projects will shine while cool animations rise delight. All the way at the bottom, Berlin sports the plainest contact form you have ever seen. When you are not far away from launching your website but the hype is already real, create a coming soon page. Or in case you are rebuilding the current page, craft an under construction website to fill the gap. 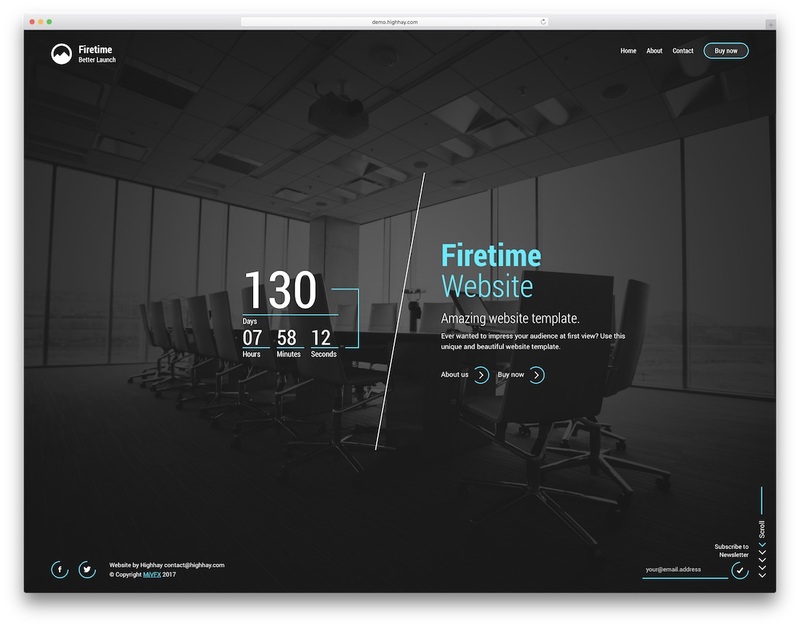 Firetime is the creative coming soon website template that assists you in making these types of sites a realization. Although Firetime mobile-friendly website template is quite minimal, you will find lots of originality in it. In other words, it is a one-of-a-kind template with a number of terrific ready-to-use layouts. From video and slideshow backgrounds to particle and snow layers, as well as a solid color. Do not lose any of those visitors even if your website might not be live just yet. Enticing coming soon/under construction page will do magic. 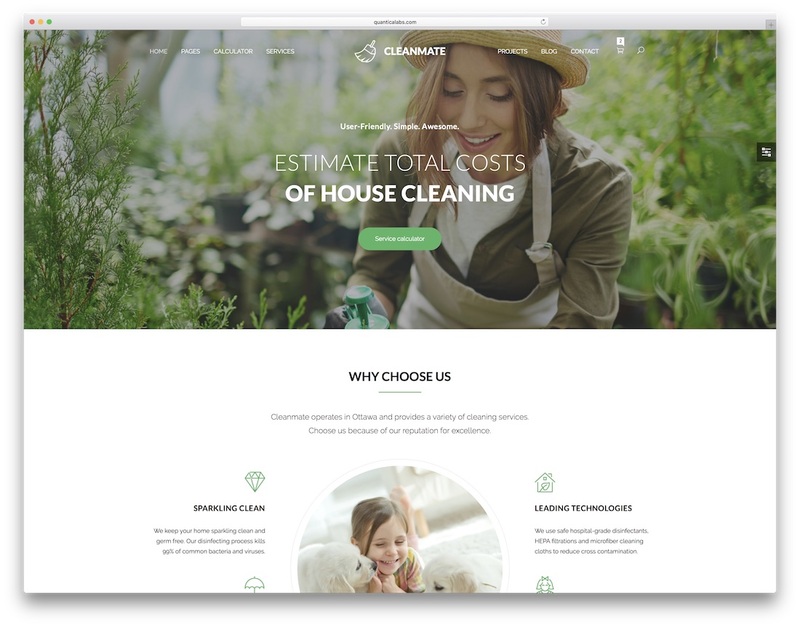 CleanMate is a retina ready and mobile-friendly website template for handymen, maids, cleaning companies and gardeners. Without any difficulties, you can also reshape CleanMate and use it for car wash, renovation services and window cleaning businesses. Without further ado, let’s proceed with constructing a website for your business. CleanMate’s modern and professional design will solve many users’ needs and requirements. You will find Revolution Slider and fantastic online cost calculator. The letter allows your clients to calculate the exact cost of your services. Get them familiar beforehand for a smoother transaction. Different page templates for projects, team members, services and blog are built into the template for you to select what you need and leave all the rest out. As for the contact page, not only does it have Google Maps but a working contact form, too. Picking only the best mobile-friendly website templates is surely a though work. Only because there are so many responsive items out there of which each has exceptional characteristics. One of them is unquestionably Rexo. 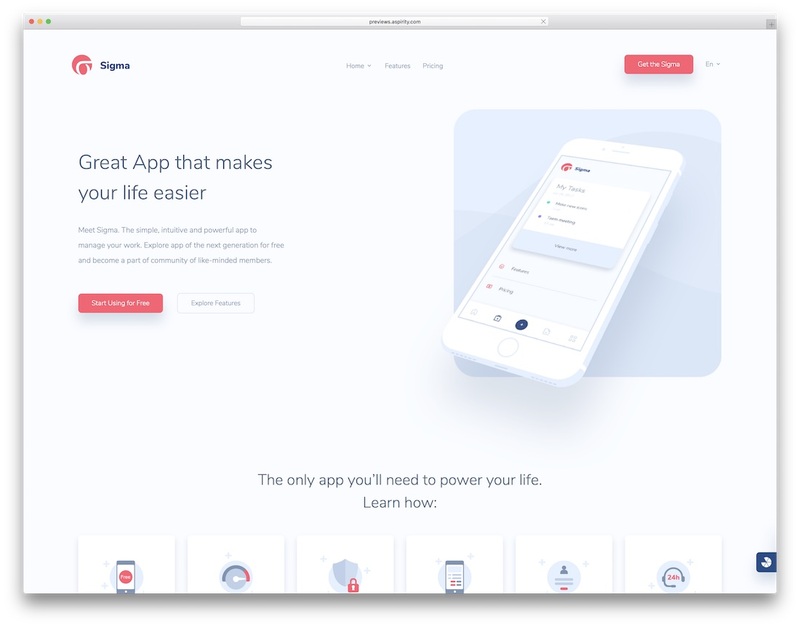 Rexo is a one-page template that uses the latest Bootstrap Framework and prides itself on the magnificent parallax effects. Moreover, it has stunning CSS and jQuery animations, supports RTL languages and comes with expert support. Off-canvas navigation for enhanced mobile UX, touch-friendly slider and free updates, with Rexo, your page always follows the latest trends. 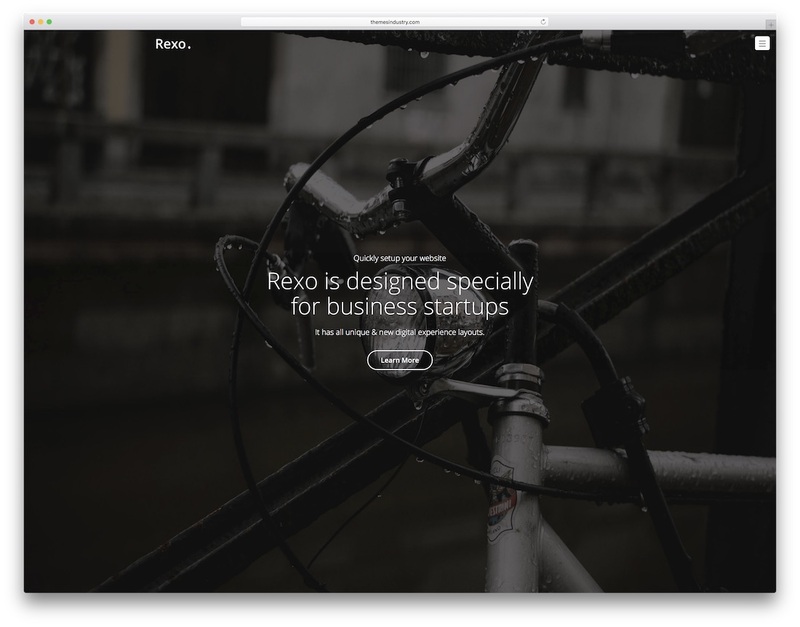 Let Rexo take over the creation of your creative agency and startup websites.